Whatever you are working on is not as important as you think. Our research shows 7 out of 10 Americans describe their work as stressful. 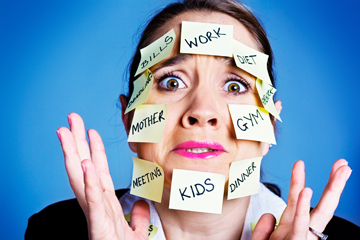 Although some stress can be positive, this may be an indication that many of us are not faring well at work. Stress costs companies money, but even more importantly, stress over time can do physical and mental damage to your body. The truth is, as technology advances, and job security becomes more fragile, managing stress is getting harder and harder. One of the biggest obstacles to achieving work-life balance is the internet and our mobile devices because they can keep us attached to our work 24/7. Yet it is vitally important to our physical and mental health that we disconnect, and come back the next day feeling refreshed. Make sure you get enough rest. Even though it varies, you should get between 7-8 hours of sleep. Eat healthy and don’t skip breakfast. Also, drinking too much coffee – while it can temporarily give you a burst of energy – it also causes you to be more tired later in the afternoon and it can interfere with your sleep. Instead, reach for fresh fruit and peanut butter or even better, natural almond butter. Most of all, don’t forget to drink water. Make time to exercise daily. If your commute means late hours, take a brisk walk in the morning. Instead of skipping your lunch break, walk around the premises or if you have a chance, go to your gym for 30 minutes. Take the stairs whenever you can. The Mayo Clinic recommends Tai Chi for a gentle stress reliever. Address conflicts with co-workers one-on-one. Refrain from having a conversation when you are angry. Take a break to relax and clear your mind. The same goes for addressing issues with your supervisor. Prioritize your tasks. At the end of the day, review what needs to be done the next day. Make goals for yourself and delegate as needed. Ask for help. Be social, eat meals with family, connect with your community. Chew gum. New research, not supported by the gum industry, says chewing gum can be a quick way to reduce stress. Most of all, remember to take a step back once in a while and put life in perspective. There’s no need to get overly stressed about things that are mostly out of your control.